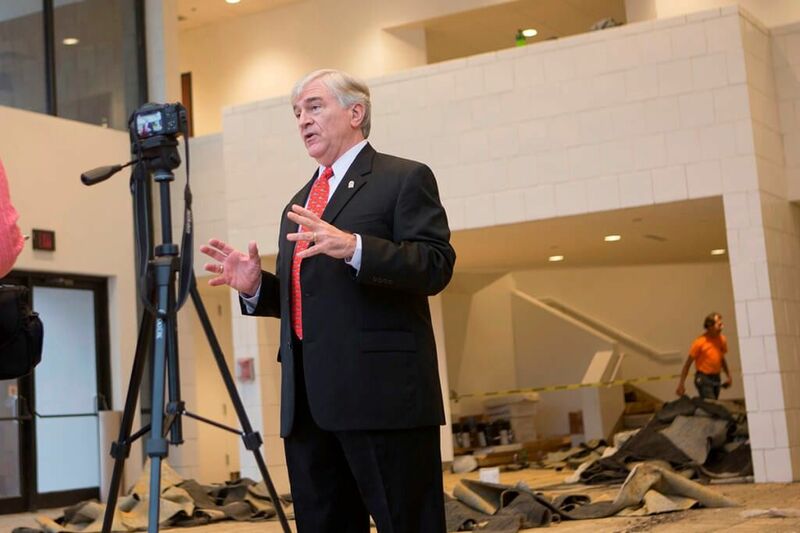 Brenau University President Ed Schrader looks over construction and renovations to Brenau’s Downtown Center in preparation for the Gala taking place Saturday, March 29. After a decade-long absence, the Brenau Gala returns this March 29 to help celebrate the university’s 135th anniversary and vision for its future, dedicate the renovations for a new physical therapy doctoral program and launch a New York-themed art gallery at the Brenau Downtown Center at 301 Main St. in Gainesville. Brenau President Ed Schrader says the event promises to be a memorable occasion. The main Gala theme, “The Art & Science of Brenau,” recognizes the university for its national leadership in two distinct areas: its major educational programs in allied health care and its significant collections of fine art. If you need additional information or wish to purchase tickets to the Gala, call 770-534-6163 or make a reservation online at https://www.brenau.edu/downtowncenter/gala/. Tickets are $100 each. For sponsorship information call 770-718-5309.